The internal intercostal muscles are a set of skeletal muscles and are located between the ribs. There are eleven muscles on each side. Among the cartilages of the true ribs they begin anteriorly at the sternum in the intercostal spaces, as well as at the anterior extremities of the cartilages of the false ribs, and extend backward till the angles of the ribs; so they are continuous towards the vertebral column by thin aponeuroses called the posterior intercostal membranes. Each muscle emerges from the rim on the inner side of a rib, as well as via the equivalent costal cartilage, and is also inserted into the inferior border of the rib above. 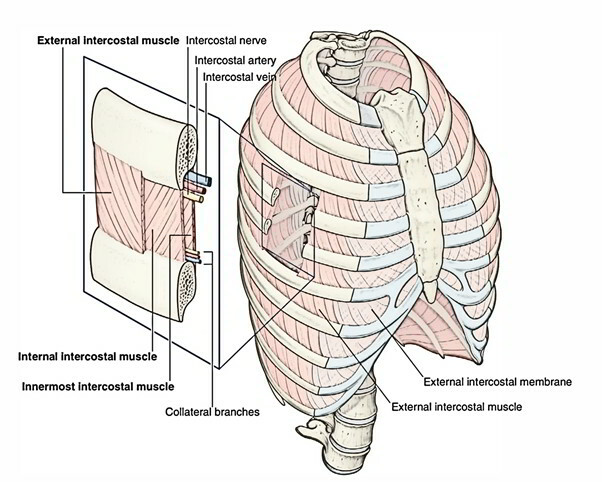 The internal intercostal muscle forms the intermediate layer. Its fibers are directed downward and backward from the subcostal groove of the rib above to the upper border of the rib below. From the sternum the muscle extends backward in front to the angles of the ribs behind, where the muscle is replaced by an aponeurosis, the posterior (internal) intercostal membrane. The eleven pairs of internal intercostal muscles pass between the most inferior lateral edge of the costal grooves of the ribs above, to the superior margins of the ribs below. They extend from parasternal regions, where the muscles course between adjacent costal cartilages, to the angle of the ribs posteriorly. As the internal intercostal membrane, this layer continues medially toward the vertebral column, in each intercostal space. The muscle fibers travel within the opposite way to those of the external intercostal muscles. The muscle fibers travel obliquely postero- inferiorly. The internal intercostals are innervated by the intercostal nerve. The internal intercostals are circulated by the intercostal artery.